Booked in the Cala Nova and was not sure what to expect. We really enjoyed our time at the hotel, very clean, staff and guests very friendly. The rooms and balconies where spacious and clean. The BBQ at the hotel on Wednesday night was very good and great value too. Would book again. 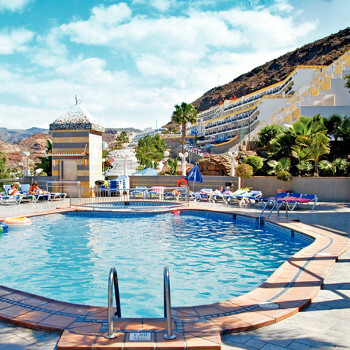 We have 2 Children aged 6 and 11 ,we were disappointed there was no entertainment for them also the childrens swimming pool is very small indeed.The apartment complex was very nice,rooms clean and comfortable the staff were very friendly and helpful. I wouldn't recommend it for families only for the above reasons, but it's perfect for couples seeking a comfortable and relaxing holiday with good size balconies with lovely views over Puerto Rico,a large swimming pool (adult)with pool bar and close to the centre. Me and my boyfriend travelled with another two of our friends which were also a couple. It was their first time in gran caneria and my second. The hotel was really clean and the staff were brilliant. They were really helpful and very polite. The entertaiment was quite poor, but that didn't bother us as we went out to the centre on an evening. We did'nt really eat in our hotel but the food was nice with a reasonable price. Continuing from my recent review i am just writing to let you know about the resort. Like i said this is my second time in Gran Canaria and both times i have been to puerto rico as i think its the best, and i would recommend it to anyone. Down in the centre there is a variaty of restaurants that offer a wide range of food that will suit everyone and are of a reasonable price. CHURRASCO at the top in the center is the best place to eatt.. u ccan get a 3 course meal for 7.50euros were u can chose from a variatyy off meals!.. The staff are brilliant aswell! The cheapest place to drink is M&Ms were you can get bottles from 1 to 2 euros..! Thats a great price to get your night started.. We did tend to get ripped off in some nightclubs so just watch out. Theres a coouple of trips i wud recomend, there was the yellow submarine weree you have the chance to see a couple of shipwrecks and a variaty of fish. There is also the canarian combo were first of all you go on the whale and dolphin tripp then you are taken on the camels which is a really fun experience!.. and after you are taken on a jeep safari which we really enjoyed, although i wouldnt recommend it to anyone who is afraiid of heightss and another thing, dont wear your best clothes or dont wear white. Well positioned in the resort - halfway in between the busy/more commercial shopping centre and the beautiful beach and harbour area. All areas very clean. Hotel staff very friendly - especially the English ones!! Entertainment was very good and broad ranging - although could have been more for children perhaps..
Based on the fact it is a relatively low-budget holiday, we found the accomodation to be as sold...basic selc catering, but very clean and very good value for money. Would definitly go back for a last minute/cheapy break. We arrived on the Monday, and it was our honeymoon. We were pleasantly surprised at everything being so clean, our rooms were cleaned daily apart from Sunday, and they even did our washing up. The bar food was lovely, and they did most things you asked for if it wasnt on the menu. The balcony was huge, and i sometimes sunbathed there instead of the poolside. Both pools were clean and just the right size. The staff were amazing, so friendly, and we already miss them! (Got home last night). There was a little noise from the shopping centre, but never enough to keep us awake, and if you dont want any noise, you dont go to a resort that clearly states there is a commercial centre nearby, do you? I'm in my late 30's and hubby is in his late 40's, and it was no problem to us. The children that were there were well cared for, the rep was at hand, and extremely helpful, and we will definitely be going back to the Cala Nova apartments. The place was cleaned from top to bottom, I mean every inch, I know, I watched them every day. I cant say I have any complaints at all about these apartments, and looking at some other ones whilst we were away, we got one of the best places. We expected a peaceful holiday in a nice apt. not so. place full of kids an teenagers -in November ? why ?Very noisy. pool dangerous, very slippy. Towels and bedding past sell by date. We did complain late at night about music level, to no avail, despite only 8 people in bar. Entertainment only on 2 nights out of 7. Maid service 4 days. Hope to go back to this area but not cala nova. beware time share sellers and promo people at centre restaurants, very persisant, and scary. Lovely places at harbour and marina with no hard sell. holiday was fine but spent as little time as possible at apt. Beware pigeons as they are a pest. People feed them and throw food over balcony- not funny if you on first floor. Arrived at hotel early afternoon checked in quickly with no problems. Room was average size and very clean, cooking area was small but adequate. Pool area is rather small for number of guests with approx 50 sun beds to cater for approx 200 guests. Arrived at hotel early afternoon checked in quickly with no problems. Room was average size and very clean, cooking area was small but adequate. Pool area is rather small for number of guests with approx 50 sun beds to cater for approx 200 guests. Sun beds were not unlocked until 9.00 in the morning but people still queue to reserve them, so if you want one be prepared to be up early. Entertainment during the day was good especially for children, with the entertainer keeping them occupied most of the day. The evening adult entertainment started at around 10.00pm and was good. The staff were friendly and hepful and the maids were excellent. The hotel location is ideal; it is approx 5/10 min walk to the centre with approx 100 stairs from pool to centre. On the whole this is an excellent hotel for the money and we will defiantly be returning. On arrival at the Cala Nova we were pleasantly surprised. We arrived around 1am. We were quickly checked in and the small on site shop was still open to buy essentials. Water is only 1.10 Euro for a giant bottle! The apartment was nice and clean though the kitchen/dining area was smaller than hoped, the facilities for cooking are very basic with just the two hobs which limit what you can cook substantially. There was only the one wardrobe in the main bedroom for all four of us. The maids are fantastic they clean,make beds and wash up the dishes in super speedy time 6 days a week! Sheets and towels are only changed once a week though and we did have to remind them about this. The whole hotel is spotless though. Pool is quite small but didn't prove to be a problem. The pool was lovely and clear when we first arrived but as the week went on it gradually got very cloudy. We mentioned this to the rep and following this the maintenance man was cleaning the pool day which improved the clarity. Poolside by the pool table is extremely slippery. Poolside sunbeds were hard to get during the first week, I think all the guests that week (mid July) were really competitive, the same people grabbing the same sunspots would be out at the same time each morning reserving beds (They were like little ants, it was quite funny really!?!). However, the rep did address this during the second week and introduced the one hour rule and this did seem to improve the situation. The balcony is huge and more than suitable for sunbathing on. The Kids Club was a major part of why we booked with Thomas Cook. The Thomas Cook Kids club was really good and as advertised. After my children had a bad experience with another holiday company's Kids Club last year they were a little aprehensive, but Giggly Gill soon restored their faith and they really enjoyed it. Unlike other tour operator Kids Clubs 80% of the sessions are free and held in a nice bright purpose built, air conditioned basement room. Unlike other tour operators also you don't have to stay on the hotel site whilst the kids are in club as long as they have a mobile number. I didn't rate the hotel entertainment.I think that the girl had only started the week we arrived and daytime poolside entertainment was sparce and a little boring. The girl failed to encourage guests to join in, and although she had the right idea with what she was trying to organise ie, water polo, water aerobics, killer pool, (the usual stuff) just the same few people (mainly a couple teenagers) joined in. Evening entertainment was basic usually a singer soundalikes, but this didn't start until about 10.30pm and by then the kids were well bored. All staff are nice and pleasant and helpful. The hotel is in a great location with lovely views, it is about a 10 min slow walk to the commercial centre, but there are loads of steps but we all know that before we go, but it is far enough away not to be noisy. Overall nice holiday would only go again without the kids, or more suitable for a young family with baby etc. My kids did get bored so lucky that the kids club distracted them a little. My husband and I stayed at the Cala Nova in November 05 and felt it was a good location, very clean, but yes the pool is a bit to small for the apartments, they had kid's entertainment so we thought we would take our 10yr old son in June 06. On our arrival we were told there was no entertainment this meant we had to look for alternative entertainment which then costs taxi's. I would probably book these apartments again but without the kid's as there is nothing for them to do without entertainment.